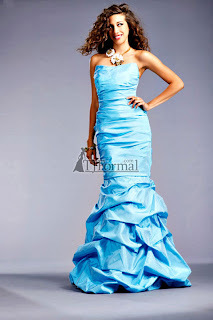 Q: Can I see photos of this prom dress in the other colors, or the back of it? If we could, we would show every angle of every dress, in every color the dress comes in! Design houses take the photos with all their beautiful models and choose the colors in which the dresses are shown, then send the photos to us. We put up every single photo we can get from them, plus occasionally we take our own if we have the dress in stock in the store. Sometimes we get lucky and get photos of every angle and even close-ups, like the Tony Bowls Shorts photos. Other times we'll get photos of each color of the dress, or at least a few of the colors. Mori Lee often pictures multiple models in the different colors of the dress. But many times, we get one photo, in one color, of the dress. We know it's very difficult to imagine what the dress looks like in a different color. If asked, we will try to at least find the color shown in a different style from that designer, just so you can see what the color looks like. So, we promise...we aren't hoarding or hiding photos from you - we want you to have as much information as possible when you make your choice for that perfect prom dress! I wish the designers would just photograph all the colors... frustrating that they don't.